Postgres is a relational database management system. Postgres is a popular choice for relational databases. It is one of the most widely deployed database engine, as it is used today by several prominent organizations and products. The above Postgres demo only demonstrates the use of a Postgres client running on the module. Running PostgreSQL server on the module is not supported. The PostgreSQL server has to be run remotely on a desktop or server machine. PostgreSQL can be downloaded from here. For managing the PostgreSQL database on the desktop or server, the pgAdminIII tool can be downloaded from here. Documentation for pgAdminIII and PostgreSQL. Download the postgres_demo source code from here. Setup WinCE development environment using this link. Modify the CONNECTION_STRING constant in the demo code as per your set up. Build postgres_demo.sln in Visual Studio 2008 and then deploy on Colibri device. Navigate to Program Files on Colibri device, project folder and run postgres_demo.exe. Following window will open showing different choices for PostgresDemo. Enter 1 to connect to the database. 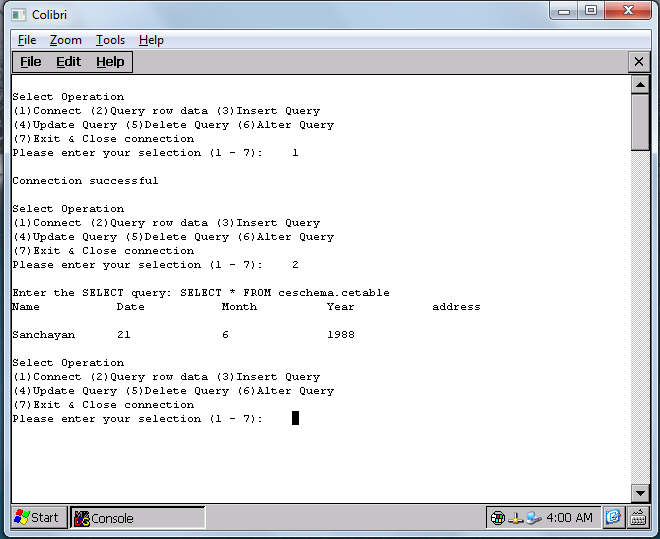 Enter 2 and the SELECT query to display the table data in database. To insert, enter 3 & then the INSERT query to be executed. For example: INSERT INTO ceshcema.cetable VALUES ('Chris', 21, 8, 1967). To modify, enter 4 & then the UPDATE query to be executed. For example: UPDATE ceschema.cetable SET "Date" = 4 WHERE "Year" = 1967. To delete, enter 5 & then the DELETE query to be executed. For example: DELETE FROM ceschema.cetable WHERE "Year"=1967. 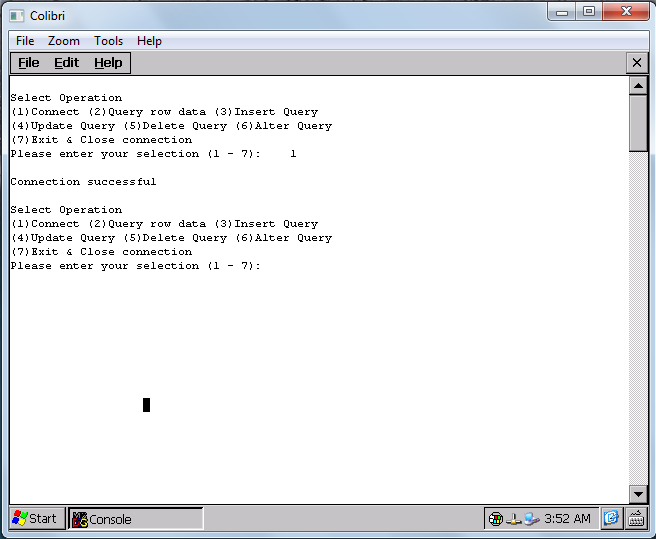 To modify the table structure, enter 6 and then the ALTER query to be executed. For example: ALTER TABLE ceschema.cetable ADD COLUMN Address varchar(50). To close the connection and exit, enter 7.